So the DVD (and blu-ray) of the movie, The Big Year, is going to be released on January 31st–very soon. But before that, wouldn’t it be cool if Greg Miller Birding blog readers had a chance to *WIN* a DVD? Pretty doggone cool, eh? You betcha! But wait! Don’t stop there! 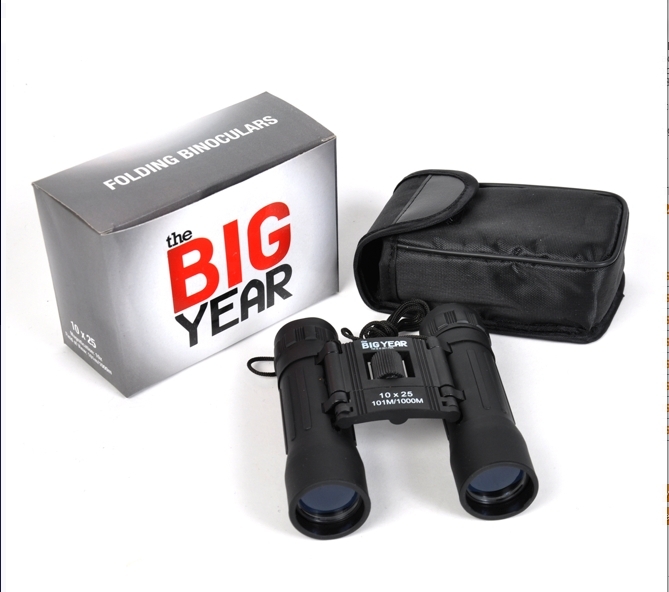 What if we included a pair of Big Year binoculars? This is pure AWESOMENESS!!! Your personal coolness factor would go through the roof with all this! In the body of the email, you must give the answer to the following The Big Year movie question: What is the species of bird that Brad Harris (Jack Black) and his dad (Brian Dennehy) go to see in a Virginia forest in the snow? You must live in the US or Canada to receive this giveaway. (I apologize to my friends afield!) This gift is made possible by 20th Century Fox Home Entertainment and the marketing folks at Thinkjam. TWO winners will be chosen (both of you will get the DVD [not the blu-ray] and the Big Year binoculars) randomly from all the email submissions with the correct answer to #3. Watch for the announcement of the TWO winners listed on this blog on January 30, 2012! Holy Smokes! I cannot believe this is really happening! It just doesn’t seem real that some personal birding adventure from 13 years ago has been a part of what inspired a Hollywood movie. Simply jaw-dropping. Miller Luck in more than just birding? ahaha! How cool is that??!!?! A lot is happening now with interviews with the stars on TV and HBO carrying a First Look at The Big Year (which I hear is quite good–I haven’t seen it yet myself). So if you haven’t had time to catch up with what all is going on, I’ll add a few links here to help you out. And Columbus fans of The Big Year can watch for an article in this Sunday’s Columbus Dispatch. Local fans (near Millersburg, OH) can be listening for a brief interview with me on WJER. NPR listeners can tune in sometime in the near future (as the movie release gets closer) for another interview with me with Mark Urycki of WKSU. I will be attending an advanced screening of the movie on Monday night in Richmond Heights, OH, thanks to tickets from the Akron Beacon Journal. Speaking of Monday, The Big Year trio (Jack Black, Steve Martin, and Owen Wilson) will be on TV with Ellen DeGeneres. And check out the Events tab on this website to see all the upcoming fun! See you all at the movie!